A round rock in the eastern part of Joshua Tree National Park in front of a deep blue sky illuminated by war morning light. 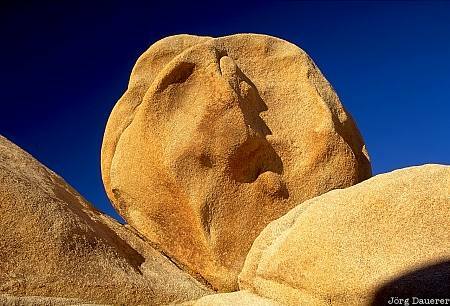 Joshua Tree National Park is in the Mojave Desert in southern California, United States. This photo was taken in the early morning of a hot day in October of 2002. This photo was taken with a digital camera.